2014 WSL Champion Gabriel Medina (BRA) sits in first on the Surf Ranch Pro pres. by Hurley leaderboard. 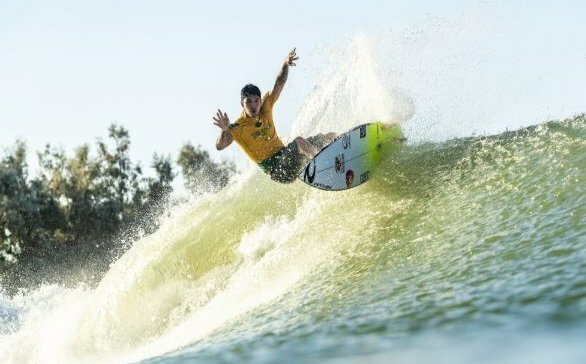 LEMOORE, California/USA (Friday, September 7, 2018) – The Surf Ranch Pro presented by Hurley fired back into action with the top-ranked surfers completing their first runs at Stop No. 8 on the World Surf League (WSL) Championship Tour (CT). Competition reached new heights with the world’s best pushing the limits in their first two Qualifying Runs, resulting in a major shift in the event standings. On the women’s side, Carissa Moore (HAW) now leads the Surf Ranch Pro rankings with Lakey Peterson (USA) in second, rookie Caroline Marks (USA) in third, and Stephanie Gilmore (AUS) in fourth. Gabriel Medina (BRA) leads the men’s rankings and is closely followed by Japan’s Kanoa Igarashi, Owen Wright (AUS) in third, and Filipe Toledo (BRA) in fourth place. Tomorrow all surfers will have two more opportunities (one right and one left wave) to improve their scores and make the Final. Competition will commence at 8:00 a.m. PST with Michael Rodrigues (BRA). The full competition schedule can be found HERE: https://wdrv.it/055706a58. Three-time WSL Champion Carissa Moore (HAW) dominated her opening run to capture the lead with an excellent 8.90 (out of a possible 10) and a 17.60 heat total. The Oahu, Hawaii competitor has been a standout since her first wave at the WSL Surf Ranch. Moore’s barrel-riding ability is among the best in the world and it was on display today, sending her to the top of the women’s leaderboard. 2018 CT Rookie Caroline Marks (USA) held nothing back in her first run and catapulted to third on the standings with an impressive 16.43 (out of a possible 20) two-wave total. The 16-year-old sensation got straight to work and earned an 8.10 (out of a possible 10) on her forehand opportunity and followed up with her world-class backhand and posted an even better 8.33 to secure her place inside the Top 4, who will advance on to the Final at the conclusion of the Qualifying Round. World Title contender Lakey Peterson (USA) delivered a near-perfect 9.23 for the event’s highest single-scoring wave. Peterson’s second score, a 7.27, put her into the No. 2 spot on the event standings, ahead of six-time WSL Champion Stephanie Gilmore (AUS), who sits at No. 4. Unexpectedly for a regular-footer, Peterson looks comfortable on the left where most of the field has struggled. Gilmore is now trailed by Coco Ho (HAW) in fifth place, Johanne Defay (FRA) in sixth, Sage Erickson (USA) in seventh, Sally Fitzgibbons (AUS) in eighth, Nikki Van Dijk (AUS) in ninth, and Tatiana Weston-Webb (BRA) in tenth. 2014 WSL Champion Gabriel Medina (BRA) took control of the men’s leaderboard today with a near-perfect 9.30 and an 8.40. Medina lit up Lemoore with an unbelievable air for a 9-point ride to secure his place at the top and will be the one to beat tomorrow when all the surfers have one more run (one left and one right) to finish inside the Top 8 and advance on to the Final on Sunday. Kanoa Igarashi (JPN) opened the men’s competition today and quickly separated himself from the pack to set the scale with an explosive air-reverse on his third maneuver followed with an immediate barrel ride that earned him an excellent score of 8.93, and a 15.73 heat total to move up to second place on the Leaderboard and surpass Kelly Slater (USA), who now sits at 9th place. Australia’s Owen Wright sent warning shots with his opening run, putting him at No. 3 heading into the last two Qualifying waves with a 15.56 heat total and impressive showing on the left, where his fellow competitors showed signs of struggling. Current Jeep Rankings Leader Filipe Toledo (BRA) struggled to find the scores in his first runs but recovered incredibly on his final right to post a near-perfect score of 9.17 (out of a possible 10). The Brasilian still has a lot of work ahead to rid himself of a 6.30 on the difficult lefthander but sits comfortably inside the Top 8 at No. 4 heading into the last day of Qualifying. Today’s standouts in the men’s Top 10 also included Kolohe Andino (USA) in fifth, Julian Wilson (AUS) in sixth, Jordy Smith (ZAF) in seventh place followed by Italo Ferreira (BRA),Kelly Slater (USA), and Griffin Colapinto (USA) in tenth. Competition will resume tomorrow morning at 8:00 a.m. PST when athletes will have one more chance to improve their scores. The Qualifying Rounds see each athlete surf six waves (three lefts and three rights) over three runs (made up of one left and one right consecutively). The best scoring right and the best scoring left are added together to create each athlete’s total score. The Top 4 women and the Top 8 men on the Leaderboard at the conclusion of the Qualifying Round will advance on to the Final.